The many health benefits of flaxseed oil makes flax seed a wonder food. Flax seed nutrition offers you some incredible wellness benefits regardless of your age or gender. Flax seed is a herb that has been cultivated for centuries for its healing properties. The seeds were used as a tonic for constipation and also ground up to make an ointment to soothe inflamed skin. Flax seed has a long list of health and wellness benefits. Generally, the seeds contain exceptionally high amounts of essential fatty acids (EPAs), rich with the healthful goodness of Omega 3, which the body needs but cannot make on its own. Along with EPAs, flax seeds are a rich source of fiber, protein, antioxidants and are the highest known source of lignans. Lignans are a particular types of plant chemicals. A diet high in lignans has been associated with reduced risks of various types of cancer such as prostrate, ovarian and breast. It has been also associated with reduced risks of osteoporosis and heart disease. In addition, lignans may target specific bacteria and viruses that can cause shingles and cold sores. Flax seed also contains about 12% mucilage, which makes it an excellent and gentle laxative. Grind your flax seeds before using them since whole flax seeds will pass out of your body and their nutrients will be unabsorbed. To grind flax seed, don’t bother looking for a special “flax seed grinder,” use an easily available coffee grinder. In baking, ground flax seed can be used as an egg substitute. Simply mix one tablespoon of flax seed with three tablespoons of water to equal one egg. WebMD has an informative article about The Benefits of Flax Seed, including a recipe for Fruity Flax Seed Muffins. Add flax seed to your trail mix. Design your own delicious custom-made-by-YOU trail mix at You Bar. Use the words "well web" (no quotes) in the coupon box to get 5% off of your entire creation. Flax seed oil is the oil contained in the flax seeds. The health benefits of flax seeds lies mainly in their oil. Consuming the oil gives you the most essential benefits of flax seeds. Flax seed is about one-third oil which contains the EFAs— good fats. The health benefits of flaxseed oil is that every cell in the body needs EFAs for proper cellular membrane functioning. Every cell’s membrane is composed of EFAs. The lipid layer of the cell membrane composed of the EFAs is essential to protect the cell from harmful substances. The brain is composed almost entirely of phospholipids, composed of EFAs. These oils are essential for proper brain functioning, the structure of the brain, memory and cognitive thinking. Flax seed oil supplements are an excellent way to enjoy the benefits of flax seed. You're getting all of their nutrients except for the benefits of fiber and mucilage. Using flax seed oil supplements is a convenient way to get all of the health benefits of flaxseed. What Is Flax Seed Oil Good For? Flax seed oil has earned a solid reputation for treating and helping all types of varied health problems from heart disease, inflammatory problems and hormonal related disorders to increasing thinking skills and many others in between. Although the above list is quite impressive of the health benefits of flaxseed oil, flax seeds and their oil may have even more health benefits. This truly is a super food. Both fish oil and flax seed oil offer a multitude of benefits largely centered on the high amounts of Omega 3. However, they are different. For the passionate vegetarian, flax seed is the supplement of choice for Omega 3. However, both flax seeds and its oil are superior in nutrition and health benefits to fish oil. Flax seed is different from fish oil. Flax seed oil has the added benefit of lignans. Lignans are a group of beneficial chemical compounds found in plants. Ground flax seeds with their high amounts of fiber and mucilage are excellent in helping with constipation, a trait that is different from fish oil. Unlike fish oil products, flax seed oil supplements do not have any fears of mercury contaminates associated with it. Flax seed nutrition may be quite stunning and it is indeed a wonder food. However, too much of anything is not good and flax seed is no exception. Due to its high fiber content, consuming large amounts of flax seed, whether whole or ground, without adequate water can cause intestinal blockage. The side effects of flax seed oil or flax seed oil capsules may be quite different. Since it is oil, consuming high amounts of flax seed oil, whether in capsule or liquid form can cause intestinal gas, bloating, diarrhea or loose stools. Occasionally, some prescription drugs or even herbs may interfere with the action of flax seed. Consult your health care provider if you are unsure of any negative reactions while you attempt to reap the health benefits of flaxseed oil. Other than these possible side effects, there seem to be no other negative side effects. 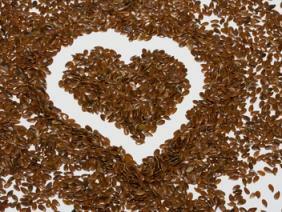 The many health benefits of flaxseed oil far outweigh the minor side effects. Flax seed oil supplements can be taken regularly every day and the positive health results enjoyed.